This book is fantastic. But don’t take my word for it, take the word of every publication that included it in their top ten list for 2016, or the judges who made it a National Book Award winner. It documents the all-to-real horrors of slavery in America, using the imaginative conceit of a slave runaway traveling on a literal railroad that runs under the ground. This masterful novel follows the harrowing journey of Cora, a slave on the run from a Georgia cotton plantation. Chapters are named for the different states in which she finds herself, each of which showcases a different aspect of this country’s disregard for the humanity of its black citizens, from the brutality of slavery to purposely infecting individuals with syphilis. While the subterranean trains themselves are fantasy, the reality of the situations Cora finds herself in is anything but. Whitehead takes genuine aspects of American racism– slavery, paternalism, white separatist movements, racial hysteria, etc. — and looks at them unflinchingly. Think of Gulliver’s Travels and you’ve got the basic idea. It’s tough and Whitehead breaks your heart repeatedly, but Cora has such an indomitable spirit that you will her through each new disaster. There are many phrases and observations that will stay with you, reminding you of the steep price some paid to provide homes and prosperity for others. “Stolen bodies working stolen lands,” said it most succinctly, but other passages — and Cora — tell it much more eloquently. Another slave asks Cora to run away with him He says she will bring him luck as her mother was the only one to ever successfully escape, abandoning a young Cora. She agrees and they begin their journey to an underground railroad station. And, hopefully, to freedom. However, in addition to the usual deadly dangers, a notorious slave catcher, Ridgeway, is determined to find her. This splendid history gives you the full picture surrounding the formation of the United States of America; and brings an eye-opening surprise on almost every page. Taylor, recipient of two Pulitzer Prizes, backs up his massive work with nearly 200 pages of footnotes. Informative, comprehensive, and mind blowing, I’m recommending this one to everyone. Forget pretty much everything you learned in history class. The years before, during, and after the American revolution were messy, nasty, mob-driven, and fractious. 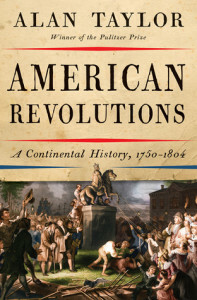 Consider this: a substantial majority people in the North American colonies were either against the revolution or neutral. Wealthy planters, land speculators, and merchants were behind the Patriot cause, using Thomas Paine’s Common Sense to persuade the common folk that a revolution was in their favor when it actually benefited the rich. Patriot mobs would tar-and-feather loyalists then trash and burn their homes and businesses. They also destroyed virtually every loyalist printing press around, leaving only one published point of view. Native nations alternately aligned with France, Britain, or Spain but only as it suited their defense against the land-grabbing Americans. Slaves often turned to the English during these times, looking for freedom but seldom finding anything but death. Taylor doesn’t merely focus on the people, politics and battles; he goes deep into the economic forces that shaped every player’s self-interests and motivations. He also shows how the empire-driven countries of that time — Spain, France, and England — used the Patriot cause as leverage against each other when not salivating over how either American loss or victory could ultimately benefit them. It’s not a pretty picture, but it is certainly a more comprehensive one. And, it’s far more realistic than the rosy view we tend to take today. There’s a mountain of information in this book; so much I could only read a few pages at a time. It’s not a “can’t put it down” book on American history, but it is certainly the most enlightening. North American colonies revolted against England and fought against each other. Despite themselves, native populations, slavery, France, Spain, and England, a republic was finally forged.